Video sharing is one of the most popular activities on the internet that everyone is patronizing. Some of the popular video clips include instructional videos about, lifestyle, DIY, health, academic, entertainment, and others. Most of the time, internet users spend most of their time watching various video clips as a hobby. With this trend, video downloading is also becoming famous, and with this post I will go and make a Freemake video downloader review for all video fanatics. Plus I’ll tackle more about the best alternative to Freemake downloader. Freemake video downloader is one of the most talked about video downloading tool that creates such an impact to all users. This downloader is indeed a powerful program that has a bunch of features that many users are looking for. One of these is its ability to get videos from almost every video hosting sites including Dailymotion, TubePlus, Facebook, Vimeo, Vevo, Hulu, Veoh, and the infamous YouTube. It also provides a clear HQ to HD video grabs that are pleasurable to watch. To rate this program, here goes the Freemake video downloader review. Can download YouTube video clips. You can get videos from more than 1000 websites. It can download embedded and private videos. You can convert video to a certain file format perfect for your portable devices. It does not have a built in player. Doesn’t compatible with Mac devices. There is an annoying message asking you to download their toolbar. There are times that Mac devices have a compatibility issue with a program or other things that are not produced by Machintosh itself. Since Freemake do not have a Mac version, how can you save online videos and TV episodes successfully? Take it easy, try a Freemake video downloader alternative now. Using this program named Video Grabber, it helps you grab various video clips directly to your Mac devices. This program is definitely a perfect substitute for Freemake Downloader, since it works well with Mac, will not require you any installation, it is free of charge, and it is jam packed with other features that can only be seen with Video Grabber. If you don’t have any videos to grab yet, you can select a downloadable video clip straight at the Video Grabber homepage. If you don’t mind, just spend a little time to watch a video tutorial, it performs how to download videos with the alternative to Freemake video downloader. On the other hand, if you are looking for a more sophisticated Freemake video downloader replacement, then you can try Video Grabber Pro. 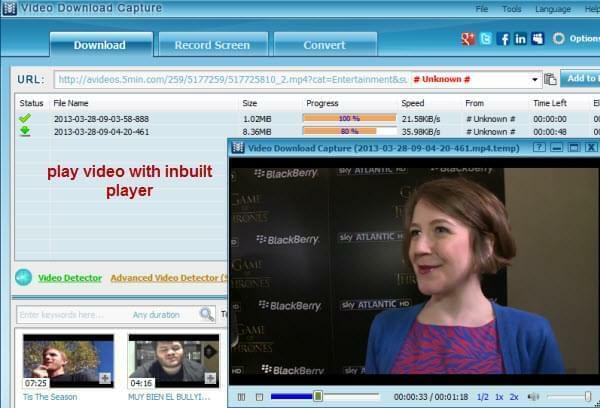 This tool is an upgraded version of Video Grabber which adds multiple features. One of the interesting feature that they add is the built in media player, that can play any video file types, allowing you to scan the video prior downloading or converting. It also supports RTMP, MMS and RTSP video downloads. After going through some features and functions, I can say that Freemake program is such a great video downloader to have. There are some flaws that may cause some concern, but in general, it is a must have downloading tool. On the other hand, I can also say that Video Grabber is a perfect choice as a Freemake video downloader for Mac. For it can function the same way as Freemake program does. Plus, it adds an overall feature for video grabbing and customization. Using the current version of Freemake as of December 2013 (3.6.2.2), Freemake does not seem to be able to connect to Hulu with a paid user account. There are several references around the internet to Freemake only downloading 90 seconds of a Hulu video by people with valid Hulu accounts. 90 seconds is the preview length for non-subscribers. I have used Freemake for YouTube and other videos and it has worked very well. This does not appear to be a browser specific issue. I have attempted changing my default browser between Chrome, Firefox and Internet Explorer, and have logged in to Hulu in all three browsers so I have current credential cookies saved to my computer for each browser, but Freemake continues to only support the un-registered user preview download. Yep, Freemake only supports downloading videos from YouTube-like sites, but as Hulu streams through RTMP protocol, which prevents the common-used tool from downloading. But no worries, Video Download Capture is the best alternative that can download any videos you watch, including Hulu, MySpace, Yahoo vdieo, etc. The steps are super easy, only click on "Advanced Video Dector" to detect what you are watching.